I am excited to join Global Voices Online Middle East and North Africa team and will be happy to cover the Syrian blogsphere alongside Yazan Badran . GVO is one of my favorite websites and I am happy to be part of its Global Voices Advocacy  and Lingua Arabic  projects as well. I hope my posts would be fairly representative to both of the Syrian bloggers and to their readers. Yaman Salahi , an undergrad student of UC Berkeley and an active member of Students for Justice in Palestine  club there, has posted a series of reactions to the club's die-in protest that took place on campus few days ago in solidarity with the 116 Palestinians killed by the Israeli army. You can view pictures of the die-in protest on Isabel's  Flickr account . 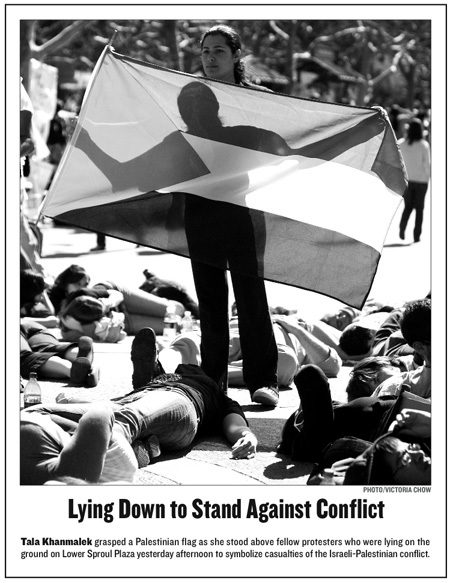 Actually, Daily Cal, yesterday [3rd of March] students participated in a die-in in solidarity with the 116 Palestinians that the Israeli army killed over the weekend in Gaza. We did not stand against “conflict,” but the Israeli occupation. Can you say those words, or is that a little too informative? Calling Yaman an anti-Semite and assuming he finds Haifa and Tel Aviv to be occupied is really low. There is nothing in what he has written that would suggest those were the things he was thinking or intending. If so he would have been involved in a great big “free occupied haifa and tel aviv” demonstration where he would announce himself as a Jew-hater. The reality is that the demonstration was to recognize the loss of life that has occurred due to the excessive, unequal use of force by Israel, on Palestinians. You only jump to those conclusions as an attempt to discredit him and show him to have violent intentions. Those are your words, not his, he is talking about a government sanctioned military occupation over a civilian population, not irrationally hating or wishing harm to Jews. 116 people died in the past few days and that pains us; we lay on the ground to grieve, we lay on the ground out of compassion for human life. None of which is anti-semetic. Their counter-protest consisted of a sign displayed ahead of our protest that read, “Victims of Palestinian Terror,” meant to confuse passers-by as to the purpose of our action. To stop the violence, step back from it . Recognize the legitimate grievances of all people in Israel and Palestine. The United States will not solve this issue; there will be no impartial or neutral arbitrator or judge who will issue a verdict that all people will follow. Cheer-leading squads for Israel like Tikvah will do nothing that can even change the status quo, let alone construct a path towards resolution and reconciliation. It is up to us to escape the suffocating influence of state narratives and to create opportunities and possibilities for the future with our own hands.